The electronic giants from Taiwan, HTC are giving in their all out with their flagship model HTC One. Though the model hasn’t still yet reached to the limit to defeat the Samsung giants of their flagship model, Samsung galaxy S4, but, they are giving in a tough challenge. The HTC has gone all out in the market survey with the latest flagship model. The HTC one was previously available only two limited base colours but now with the inclusion of the glamorous red, the HTC one seems to be a real eye candy for the visual and a great look to finish it off in style. Though there are many smart phones in the market that comes in with multi colour models. Some even have the replaceable casing to match with the style. But not all changes or variant of colours look good on the mobile casing. Especially with plastic bodies, The Samsung Galaxy S4 looks extremely ordinary and some time below ordinary. But the unveiling of the HTC’s ‘HTC one glamorous red” colour marks a special mention. The reason for this being that the HTC one has always been complimented for its high end design and look of aluminium coating in the silver and black model, which makes it look extremely stunning. Thus, the red colour marks a high end note to this flagship model if not above par with other two colour ranges of the series. As seen from the visuals of the HTC one glamorous red, we find that the phone is full on layered on metallic casing, and it is quite glittery and shinny due to its aluminium structure. Though the black and silver models of HTC one were good enough to stand out , but due to its lustrous structure the coloured coating gives in an extra edge of the base colours of the devices. 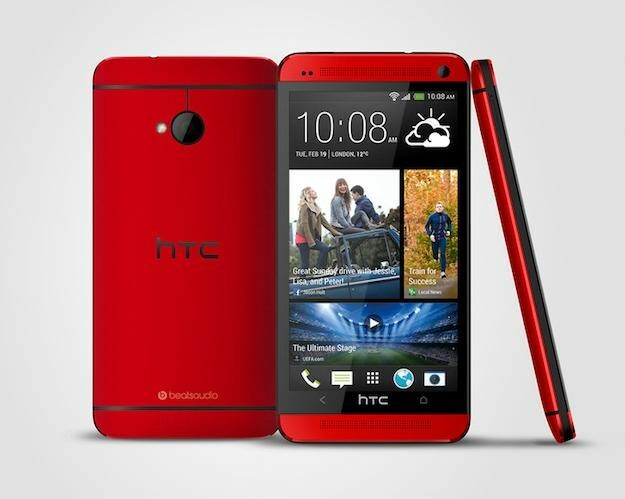 People can easily get attracted to this newly released glamorous red colour HTC one at one go. We can firmly say that the HTC One in red has nor cut down on any of its design features as we see the red colour coating in the rear part of the smart phone, which has even extended to the dual speakers of the said device. When handed the newly launched HTC One in red we felt quite more textured than its predators in black and silver colours. The smart phone seemed to get fitted and adjusted well in our hands, a bit more comfortably that the other HTC one ranges as the gripping system of the smart phone has been taken a new improvisation. Though HTC One has always been a star of the show, but in design and outlook, or can be said in more specifically, the scratch power, is something of a worry. The HTC one in silver and in black are seen in the past, being prone to scratches, which affects the classic design. The chipping and scratch prone is one of the drawbacks of the HTC one. Though the glamorous red HTC one, has not yet been tested in this sector, but seems to be a big worry for the users to know about this flaw. The HTC one red is designed in similar to the looks of iPhone. The HTC one red which is launched lately will be sailing in the commercial market with the android 4.2.2 version installed in it. This is quite smart work, as here will not have the mess of upgrading the smart phone to the latest versions. The smart phone will come with the launch bar at the bottom as well as it will have a quick access to settings. With the android version 4.2.2, it will also be packed with the upgraded camera features in built in it. Apart from the above staged changes, the HTC one in glamorous red will be of the same features in the display screen, it will host the LCD screen. The same classic audio and sound quality that people got to experience in the black and silver HTC one devices will find it here also. So, if you are looking for a more stylish HTC one with an improved grip and better camera and interface settings then grab on the latest HTC one glamorous red.